NOTE:This system requires periodic replacement of the brine salt. This does not come with the system, but is readily available from most hardware and home stores for $5-$8 per 40lb bag. ResCare will chemically clean a fouled resin bed of a water softener and restore the exchange capacity of the resin. Most types of water softening resins can become fouled with iron and other contaminants that will affect the performance of the ion exchange system. Iron fouling can cause channeling, pressure drop, loss of capacity, hardness and iron leakage. Regular use of ResCare will minimize fouling and extend the resin life in the water softener. First Application/Fouled Unit: Pour 4 oz. (1/2 cup) of ResCare per cu. ft. directly into brine well (for softeners with no brine well, pour directly into salt tank when salt is low). Manually regenerate softener. Repeat regeneration if taste, odor, or discoloration is detected in discharge, then run cold soft water tap nearest the softener until the odor or taste is gone. Prevents iron and mineral build-up on integral parts of the softener. Removes iron and aluminum fouling that causes lost capacity and a decrease in performance. A non-ionic surfactant is added to aid in the cleaning of oil fouled resin. A liquid Phosphoric Acid mixture. ResCare is not to be used with Gel Zeolite materials. Fine mesh resin permits greater exposed surface area exchange sites resulting in high kinetics than conventional resin yielding greater ferrous iron removal while providing the same softening capability. Should I treat all the water that comes in the house? We recommend that the nearest out side faucet should be bypassed and if you have a sprinkler system for your lawn that should be bypassed also. We like to see one of the outside faucets use condition water for such things as washing cars (no spots), washing windows and siding, kids pools etc. The last thing you need to do is clean the spots from windows that has just been washed with hard water. Hard water is water that contains more than 1 GPG (grains per gallon) of dissolved minerals. (Usually calcium, magnesium). 17.1 PPM or Mg/L = 1 GPG or PPM or Mg/L divided by 17.1 = GPG (grains per gallon). I've read ads that claim that Magnetic (magic?) Softeners would solve hard water problems. What is your experience? Magnetic "conditioners" have been around for over 30 years and we have yet to see one that works. When we see one and only one equal claims maybe we will carry them, until that time we will not get involved in an unproven technology. Why does the water softener have to add salt to the water? A softener works by passing the hard water through resin beads which have soft sodium/potassium ions attached to them. While the water is in contact with the resin beads an ion exchange takes place with the hard mineral ions (typically calcium and/or magnesium) trading places with the soft sodium/potassium ions. After a period of use the sodium ions are depleted being replaced by calcium and magnesium. The resin then needs to be regenerated with the sodium ions so the resin will again be able to exchange the hard for the soft. However you can use potassium chloride. How long does it take for a softener to regenerate and how much water do they use? It depends on which water softener you purchase. There are four categories manual, electric mechanical, digital, and twin demand. Each one has a different time span for regeneration. Some units are more flexible than others and you should call us at 1-800-767-8731 to discuss what options are available. One thing to remember is that the larger the unit the longer time between regeneration. You will use more water to back wash a larger system. Is a water softener a purifier? A water softener is not a purifier and should not be sold or purchased to be one. A water softener is used for the reduction of hardness, iron and manganese. Water softeners will not remove chlorine, bacteria, or solids. Why would I want to soften my water? The water feels great!!!! You will be amazed how much time and money you will save on soap, shampoo, laundry detergent, fabric softeners, dish washing soap, hand soap and lotions. Soft water greatly reduces the scaling in pipes and faucets. You spend less time scrubbing with abrasives cleaners, and you will have no soap scum in tubs and showers. Facts show much longer life on hot water heaters, greater saving on fuel bills, extends the life on dishwashers, humidifiers, clothes and so much more. And if you like luxurious bubble baths, shinier hair and cleaner skin, soft water is the way to go. Someone told me that softened water feels slimy. Is this true? When you wash your skin with hard water, there is a layer of soap and minerals that is left on your skin. This is what causes the supposed squeaky-clean feeling. With soft water, the soap is completely rinsed away leaving just the natural oils your skin produces. I've heard that a water softener adds sodium to my water supply. Is this true? Yes. A household water softener removes the hardness minerals - calcium and magnesium - from water and replaces them with sodium ions or potassium ions (if you use potassium chloride). No, stores that sell softener salt will also sell a salt substitute (potassium chloride). This is just as effective as the regular salt, but add potassium instead of sodium. The downside is that potassium chloride costs between 2 and 3 times more than the regular softener salt. What should I look for in a water softener? One of the main features you should look for is capacity (measured in grains) and how it determines when to regenerate. We carry 24,000, 32,000 48,000, 64,000, 96,000, 128,000 grain capacity plus water softeners. Most units meter how much water has been used to determine when it should regenerate. This is what we call demand regeneration. Some units regenerate after a fixed period of time regardless of how much water you've actually used. This type of unit will may use more water and salt. What difference does size make? Example… 32,000 grains softener in combination with knowing your hardness level will tell you how often it will regenerate, and consequently how often you will have to add salt. If you have a family of four and your hardness level is 10. Divide the 32,000 by your hardness (10), giving you 3,200 gallons of treated water. The average person uses about 75 gallons per day, so divide the 3,200 by 300 (75 gallons x 4 people). This gives you 11 days between regeneration. Our softener uses about 9 lbs. of salt per regeneration. How much water does it take to dissolve 9 pounds of salt? One gallon of water will dissolve 3 pounds of salt. To dissolve 9 pounds of salt, you will need 3 gallons of water. Do I need an exact amount of salt in the brine tank for the softener to regenerate properly? The amount of salt placed into the brine storage tank has nothing to do with the amount of salt used during the regeneration cycle. Water will dissolve and absorb salt only until it becomes saturated. A given amount of brine (salt saturated water) contains a specific amount of salt. Just make sure that there is at least enough salt for a regeneration cycle. Should a softeners capacity be large enough so that it does not regenerate more than every two days? Yes, most dealers like to see four days or more. What is an ideal period between regenerations? Once a week is a good rule of thumb. 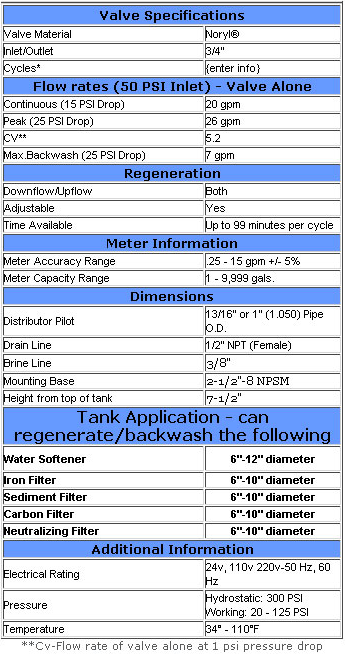 Do long periods between regeneration (say a month) have any negative effects on the softener? A water softener should be regenerated when the softener has reached its capacity and is unable to keep exchanging the hard ions for the soft ions. How often a water softener regenerates is dependent on how many grains per gallon of hardness is present in your water and the capacity of your water softener. If the capacity of the water softener is 40,000 grain, and you have 10 grains per gallon of hardness, then your softener would regenerate after 4,000 gallons of water had passed through it. How quickly you would use 4,000 gallons of water would really depend on your water usage. Long periods between regeneration would not have any effect on the softener if water were being used and traveling through the softener. If water is not being used, sitting in the softener, then the water in the softener could be bacteriological fouled. Fouling would depend greatly on condition of your well water or water source. What should I do if I have not used water through my water softener for a month? Add 2oz. of chlorine bleach to brine tank. (pour it down the brine well). What makes your softeners (or filters) better than others that charge as much as two to four times the price? The first thing to look when purchasing a system is the company. Aqua Science is a 26 year old company with over 50,000 customers. Our only business is water. All softeners, regardless of price, should soften your water (i.e. reduce the hardness to 0 grains). The question is how long will the unit last? How often does it regenerate? How large is the grain capacity? Does the softener regenerate based on time rather than how much water has been used? How easy is it to change the settings and service the unit? How quickly can you get your questions answered and your problems solved? What's the difference between demand versus timer units? The difference is that a demand softener only regenerates when you use enough water to cause it to regenerate. The automatic timer or day clock model units will regenerate at a specific day even though you have not used any amount of water. ( however the day time models are some time better with ph neutralizers, backwash carbon filters, iron filters etc). Savings in salt and water is the big difference and this is very important in your purchase decision. Why do you recommend a two tank system over a one tank system? Salt water is corrosive. If you live by a beach and have a car, you see the results all the time. With one tank system the controls are very close to the salts. We feel that it's far better to keep the electronics away from the effects of the salt. Another important thing to consider is with a cabinet model unit the mineral tank is in the center of the salt. Tanks will sweat from time to time. The sweat gets into the salt, causing the salt starts to dissolve. The sweat will stop sooner or later depending on the humidity in the air. The wet salt will bridge causing a problem that could cost you a service call. With a bridged brine tank there will not be enough brine to regenerate your system and your water quality will suffer. Can a water softener harm my septic tank? After targeted research, the answer is NO - soften with confidence. On-site household sewage disposal systems work simply. The main soil pipe from a home's plumbing system empties into a concrete or steel tank buried a prescribed distance from the house and beneath the frost line. The common single-compartment tank has a baffle near the inlet pipe, which prevents the effluent from backing up, and reduces the turbulence of the incoming waste. Once the effluent enters the tank, the heavier solids sink to the bottom, while more buoyant substances rise to the surface. Various bacteria present in the effluent, as well as other organisms, which have been introduced to the tank, digest the waste material and chemically change it. The bacterial action, working in the absence of oxygen, is referred to as an anaerobic process. Another vented system is operation all similar, but the decomposition is aerobic, i.e., requires air. After the bacterial action occurs, relatively clear water is discharged through the outlet pipe of the tank. It flows to a distribution box, where it is diverted to the drainage field through perforated, loosely connected pipes. The loose joints and perforations permit seepage into the surrounding soil. To enhance the water dispersion, the pipes are generally laid in beds of gravel or loose rock. This covers the disposal system side of the story. The other side concerns water before it gets to the tap, and features the water softening system. 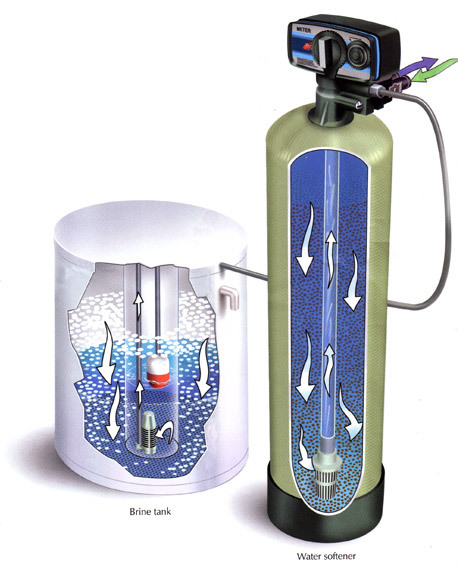 A typical water softener uses a resinous material that attracts sodium ions. The ion exchange resin reacts with the influent water exchanging the sodium ions for the calcium and magnesium ions. Calcium and magnesium are naturally occurring minerals present in many water sources. The presence of these ions makes water "hard." Exchanging the calcium and magnesium ions for sodium or potassium ions "softens" the water. During the regeneration cycle, the hardness ions are removed from the softener exchange resin, and discharged with the backwash and some excess regenerant salt (sodium chloride or potassium chloride) that is necessary to drive the regeneration reaction. In the 1970s, a number of counties and states became concerned about the effects of the softened water on septic systems. Although the assumptions proved wrong, there were three primary reasons for what turned out to be unfounded concerns and false assumptions. It is commonly known that bacterial life forms are threatened if their surroundings have too much or too little salt. It was feared that the higher concentration of salt in the effluent or softened water would be harmful or fatal to the tank's bacterial action. The second concern was that the backwash flow rate during regeneration would introduce water faster than the tank could handle. This would force effluent out of the tank before the bacterial action could be completed. In other words, "unprocessed waste water" would be sent out into the drainage field. Finally, it was feared that the salt brine produced by the softener would lower the drainage field's ability to absorb water. This assumption came from agricultural studies on irrigation systems with high sodium content. These were "common sense" arguments about a suspected problem, and weren't verified facts resulting from scientific testing. As a result of these assumptions and to address this situation, the Water Quality Association (WQA) sponsored research at the University of Wisconsin (Madison) and at the National Sanitation Foundation (NSF). These groups conducted comprehensive studies to confirm or reject these assumptions. The opposite of the assumptions listed above was shown to be true as a result of scientific testing. First, the effect of softened water on bacteria was actually beneficial rather than detrimental. The normal salt content found that in "unsoftened" effluent is less than ideal for bacterial growth. The addition of sodium to the system was found to bring the bacterial environment closer to the optimal range. Soft water was, in effect, "healthy" for the organisms. Second, the volume of backwash during regeneration did not disrupt the time involved in bacterial processing of effluent; it was easily within the limits that the tank could handle. It was noted that an automatic dishwasher would pose a greater threat on these grounds than would a water softener. The conclusions drawn from these tests is that softened water is NOT harmful to a normally operating septic system or drainage field. Obviously, this is good news to anyone who has suffered through dingy dishes or clothes, or struggled with precipitate build-up in pipes due to hard water. Homeowners can enjoy all the benefits of soft water without worrying that it will disrupt the efficiency of the household septic system. Ref: Water Quality Research council; Revised September 1992. Will a softener remove iron/red stains from my water? If the iron is in its soluble form or clear iron (ferrous iron or Fe++) then in most cases it will, however it depends on how much iron you have. To remove ferric iron (Fe+++), you must use an iron filter. There are many different types of iron filters that can be used, all work with limitation, which you should know about before you chose one. We suggest you call us at 1-800-767-8731 for different types that will fit your special needs. Will a softener remove tannin? There is Anion tannin resins you can add to a water softener in the softener tank, which does a nice job in taking out tannins from water. What kind of resin does your softeners include? Our softener comes with CATION resin. What if my hardness is greater than 10 grains per gallon? If your water is harder than 10 grains per gallon then it will tend to foul the RO filter prematurely and will void any warranty. This is the case with almost all brands of RO systems. If your water is that hard we would recommend a water softener.